Queen Victoria School under 19 team during Fiji Secondary School rugby league southerneastern zone competition at Bidesi Park on February 9, 2019. Photo: Ronald Kumar. 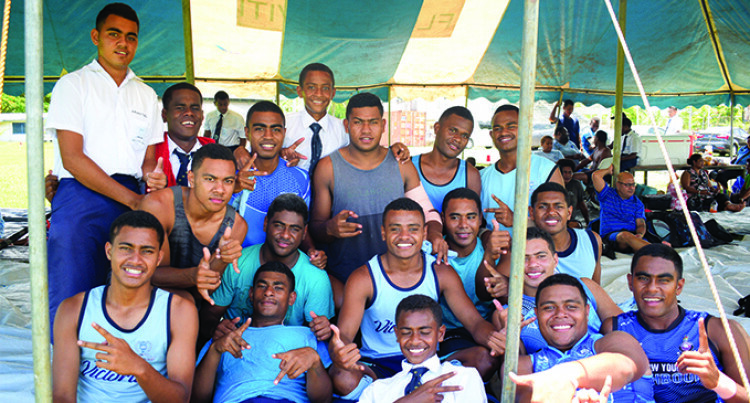 Fiji Secondary Schools Rugby League first timers Naitasiri Secondary School aim for a positive outcome in this year’s competition. The Naluwai- based school made their first appearance in the Southern/ Eastern Zone Under-19 competition yesterday and won by default over Sacred Heart College. Manager Philip Halofaki said they went through a lot of difficulties when it comes to sending a team to Suva every Saturday to participate. “It was a difficult start for us when we decided in our staff meeting that we will take part in the competition,” he said. “Finance was our biggest challenge. We did not have the funds but we are thankful that we all worked together to get the show started. The school is fortunate to have their school bus transporting them to the games. Meanwhile, Queen Victoria School and Ratu Kadavulevu School retained the Vodafone Tanoa and Shield respectively. QVS trounced Ratu Sukuna Memorial School U19 side 32-16 while RKS beat Nasinu 24-6.